As I mentioned in my previous post, I decided to stay in Salamanca for the week of Semana Santa (or ‘Holy Week’ in English), between squeezing weekend trips to Bilbao and a visit home. Many other students flocked for the entire week back home to spend with family and friends, others travelled, not many stayed in Salamanca to experience Semana Santa though, it was quite sad. Luckily I managed a mix of all three – although my weekend at home felt extremely short, as did my trip to the Basque country – you can’t win! 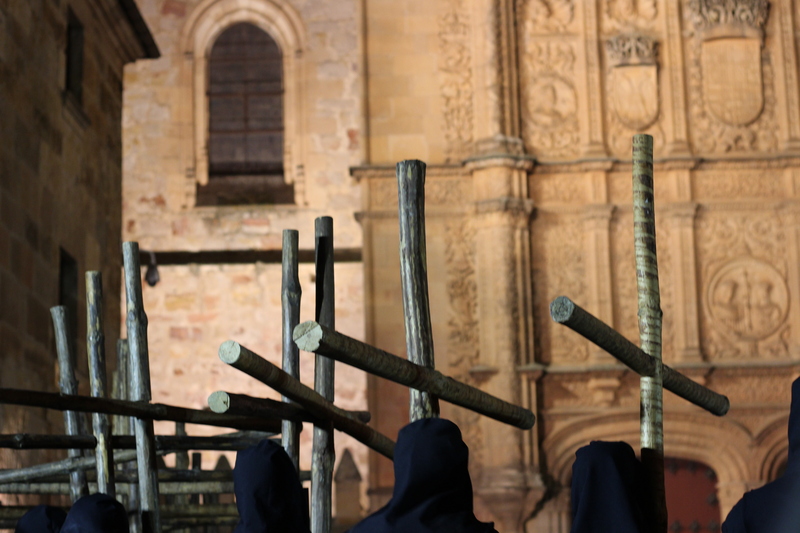 Semana Santa is a major festival leading up to Easter in Spain, with processions at least once a day held in most towns and cities across Spain. My opinion was that it would be a shame to miss out on seeing the festivities, as it is regarded as the most important weeks in the calender in Spain, especially as Salamanca’s Semana Santa is a Fiesta of International Tourist Interest of Spain since 2003. The combination of the festivities and the fact that most children are off school for the holidays, Semana Santa in Salamanca became quite hectic. It was impossible to walk through the narrow streets due to the large crowds waiting to see processions and it got a little too much. However, I did manage to see Monday’s and Tuesday’s processions (Lunes y Martes Santo) which walked around the city through different routes. These were the two processions I had wanted to see when I looked up all the different ones (there are a lot!). The main reason why I wanted to see the procession on Monday of Holy Week, was because it was the Cristo de los Doctrinos. What makes this procession quite special and evidently quite unnerving, is that the procession is carried out in complete silence, i.e. it is the only procession without a musical accompaniment. We managed to get a great view of the procession from near La Casa de las Conchas. What amazed me was the scale of the procession, there were hundreds upon hundreds of participants, ranging from young children to the older generations. 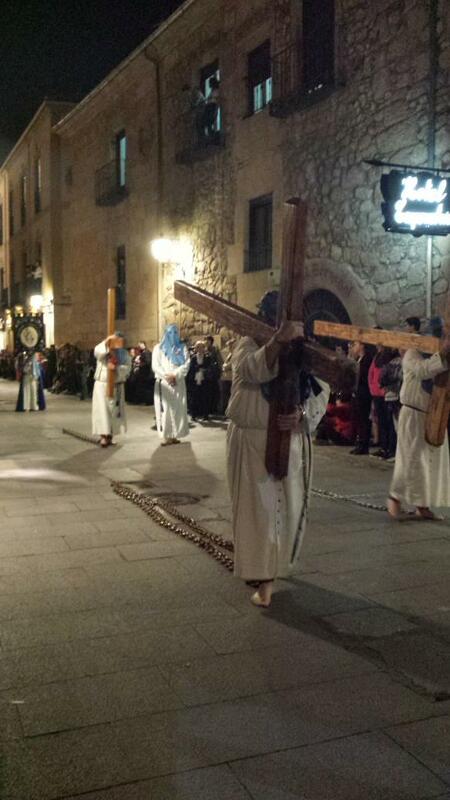 Many held candles and crosses and most wore the nazarenos (the pointy hat tthings), but what really moved me was that there were men carrying heavy wooden crosses whilst dragging heavy chains as a sign of penance, which were attached to their ankles. The fact that there was total silence, except for the dragging of chains, yep, that was quite creepy. What is astounding is how the hermanos de paso manage to carry the floats for the pasos (wooden sculptures that narrates a scene from the Passion of Christ). On the Tuesday, they had to carry the float from underneath, and were completely hidden from view by material. There was a drum beat that helped them to walk in unision and guides at the front and back to guide them. It’s hard enough carrying them, but not being able to see where you are going? 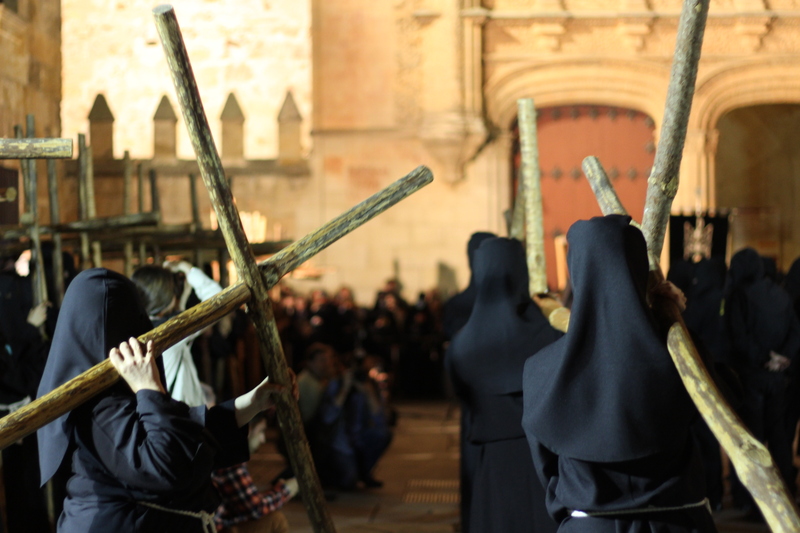 On Jueves Santo, the Procession of the Via Crucis is the longest of all the processions in Salamanca, and it takes six hours. Six hours carrying one of those wooden floats?! Fun fact: about 35 people are needed to carry them. Tuesday’s procession was also quite unique to Salamanca because the procession is of the Hermandad Universitaria del Santísimo Cristo de la Luz y Nuestra Señora, Madre de la Sabiduría, i.e. the University of Salamanca’s procession – yes, the university has it’s own procession! Pretty cool. 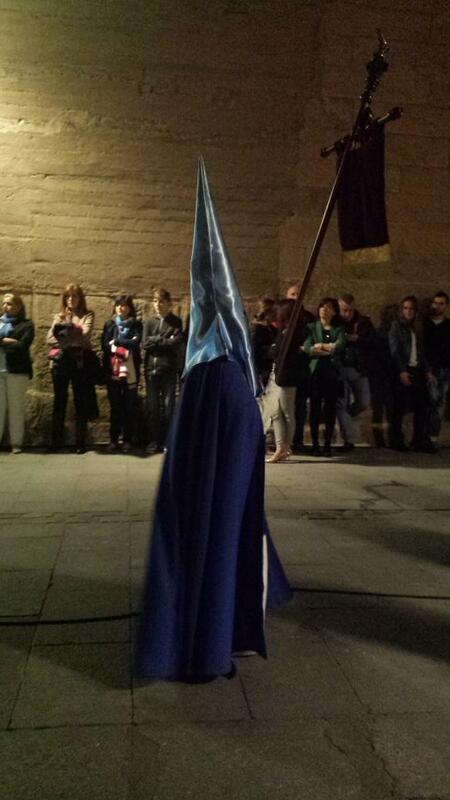 We have crazy societies at uni in the UK, but in Spain you can do this (albeit if you’re Catholic…). We read that the main highlight of the Procession would be found in the Patio de Escuelas (outside the main original university building) where there is a choral recital and a Promesa de Silencio (Promise of Silence). We were advised to arrive half an hour prior to the arrival of the procession, we arrived 45 minutes early, and we were met to a large crowd, controlled by barriers. We did manage to get a good spot though luckily. Everyone else seemed to have the same idea as us! For 2€ entry/students, it’s a great offer, and this convent is much bigger than the other with quite a few rooms to discover, although we only stayed 40 minutes as it was a stop-off on our way back from shopping on Calle Toro! Entry also allows you inside the church, where we were able to see the floats for the following day’s procession. There was a man on duty who seemed to be there to answer questions for people like us, so James insisted that I speak to the man in Spanish to find out some more (woo, Spanish practice). I asked about how many people it takes to carry (35 people), how old the floats were (one was only 3 years old!) and when they would be leaving. It turned out, these floats were for the Procession of the Hermandad Dominicana, which was on Good Friday (the following day). However, it was to leave at 5am. I thought I had heard incorrectly, but the Spanish was right, 5am. 5AM!?!?! And the man was very insistent that we should attend to see the procession. I guess it isn’t the most popular procession to watch with it being 5am and all that so they need all the tourists they can get. I would have loved to have seen it but I love sleep too much to get up that early in the morning (sorry). Luckily we got a glimpse at the floats beforehand, so we didn’t miss out on that! 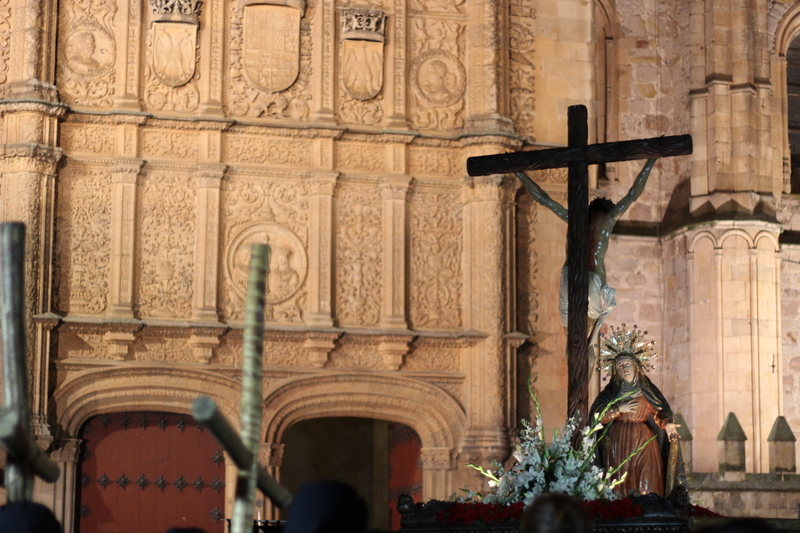 Although we didn’t see ALL the processions during Semana Santa (although I think that’s a rather impossible challenge! ), I’m glad to have seen the ones I saw, and don’t regret staying for the week, even though it resulted in me having a very short two full days at home. It is an aspect of Spanish culture that’s so interesting, as it is so different from how we experience Easter in the UK. Easter is much more commercialised in the UK, and more concerned with how many chocolate eggs you can eat in one day, albeit there is religion that many still adhere to,. However in Spain, there are a very few chocolate eggs knocking about as they are not the focus of the holiday. The focus is purely religious and about tradition. If you have the opportunity to be in Spain during Semana Santa, it is definitely worth looking to see if there are any processions nearby in the area you are staying in, and seeing an important part of Hispanic culture in the works. 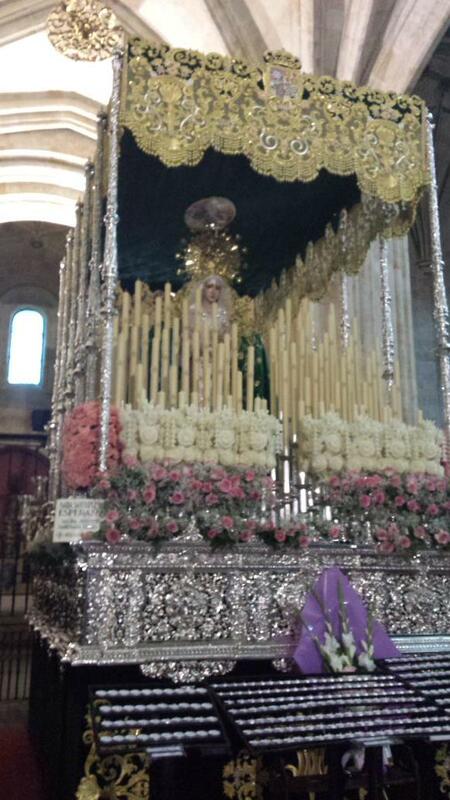 Did anyone else see processions elsewhere during Semana Santa? 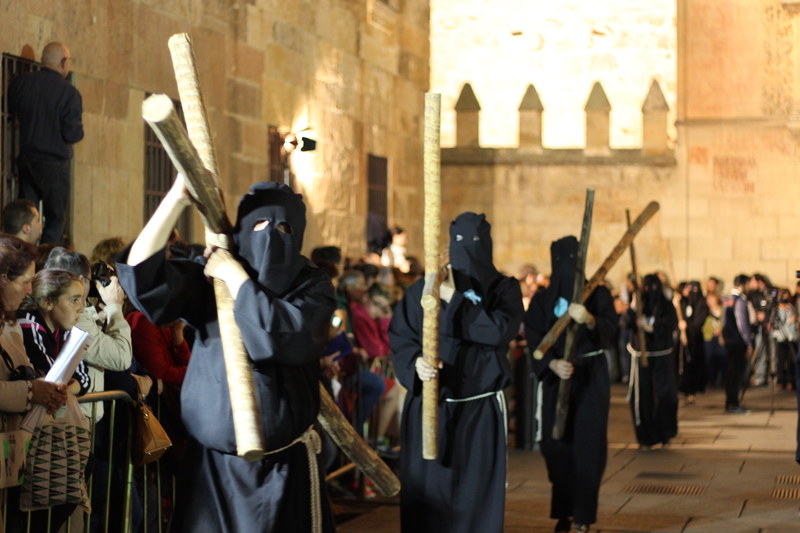 If you haven’t experienced Semana Santa yet, does it interest you enough to come to Spain for them in the future, or is it not up your street? Let me know! Good post, good pictures. 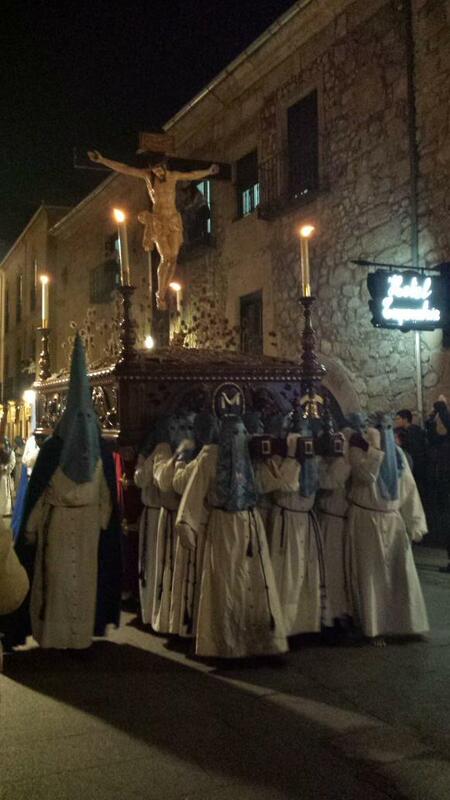 I have seen the Semana Santa in the small town of Siquenza (twice). It is a good procession and the crowds are much smaller than in the big cities although I would like to see one of the larger events. Thanks for sharing, interesting to read about another town’s processions. 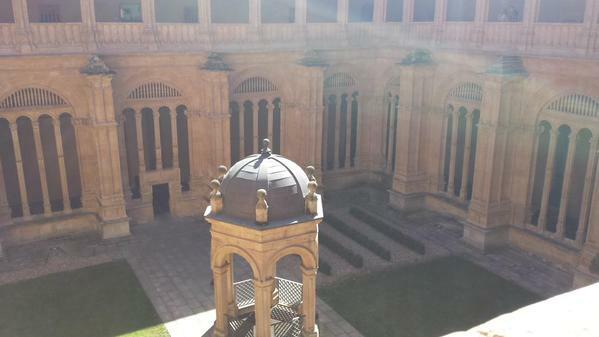 I’d like to see Seville’s in the future, it would be quite different to Salamanca.